James Jones had his first career multi-homer game on Saturday night. 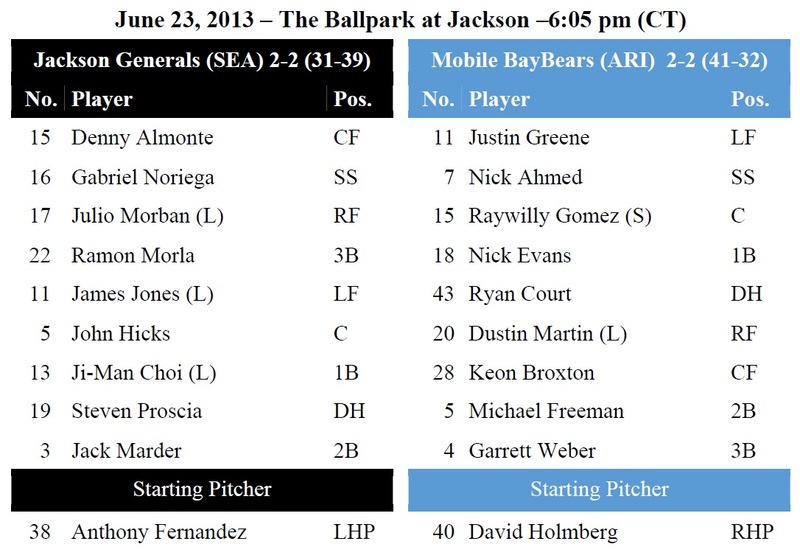 TODAY’S GAME: the Generals conclude the 5-game series with the first half South Division Champion Mobile BayBears (2-2) with the rubber match of the series…this is the 5th of 15 meetings during the 2nd half between the clubs, but last in Jackson… 22-year-old Anthony Fernandez makes his 10th start of the year…made 1 start against Mobile last season during the regular season allowing 4 runs, 3 earned on 6 hits in 4.1 innings on 8/27 at MOB…made SLCS game 4 starts at MOB last seaosn and took loss in series clinching game…allowed just 1 run on 3 hits in 6.1 innings, striking out 3 and walking 2. GENERALS RECAP: CF James Jones hit 2 home runs including inside the park homer and RF Julio Morban knocked in 5 runs as Jackson defeated Mobile 10-5 on Saturday night. Morban (3×5, 3 R, 2 2B, HR, 5 RBI) tied his career-high with 5 RBI (also: 5/14/12 vs. Visalia w/High Desert), while Jones recorded his first career multi-home run game. 2B Gabriel Noriega (2×4, R, RBI) recorded the team’s only other multi-hit game. Starter Chance Ruffin (6.0,6,4,4,1,2,HR) recorded his 4th win of the season, allowing 4 runs on 6 hits in 6.0 innings. LH Nick Hill (1.0,1,0,0,0,1) and LH Kyle Hunter (1.0,1,0,0,0,0) tossed a scoreless inning in relief, while RH Stephen Shackleford (1.0,2,1,1,0,2) allowed a run in the top of the 8th. 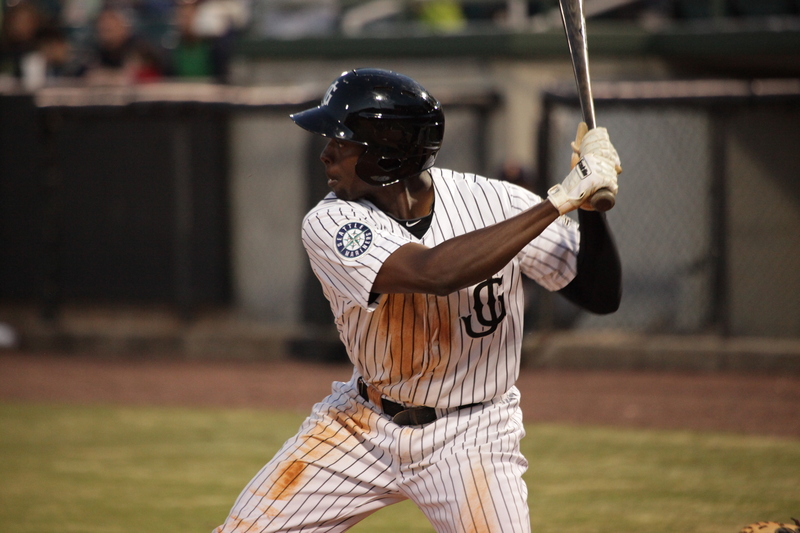 YOU ALREADY KNOW…that James Jones recorded his first career multi-homer game last night that included an inside-the-park round tripper, but DID YOU KNOW?…that the last muli-homer game by a General was Joe Dunigan last season on 7/15 at TNS. The last inside-the-park home run by a General came on 5/6/11 vs. BIR as Jake Shaffer hit an inside-the-park grand slam in the 8th inning. NEWS & NOTES: 29 of first 70 games have been 1-run games (10-19) which is the 2nd in all of minors…41 of 70 games have been decided by 2-or-fewer runs (13-28) and 6 have been extra-inning games (2-4)…In games decided by 3+ runs the Generals are 18-11. • ALUMNI REPORT: Tacoma LHP James Paxton struck out a season-high 11 batters last night in a 2-1 loss vs. Fresno. It marked his 9th career start recording at least 10 strikeouts (last: 11, 5/13/13 at New Orleans). • LEADING THE LEAGUE: OF Julio Morban is now leading the league with a .330 batting average. He has hit safely in each of his last 4 games, batting .500 (8×16) with 6 runs scored, 3 doubles, 1 home run, 1 triple and 8 RBI. • MIGHTY MOUSE: SS Chris Taylor has hit safely in each of the 4 games he has appeared with Jackson, batting .286 (4×14) with 3 runs scored, 1 double and 1 RBI.